Ernie was born in Rio Piedras, Puerto Rico and came to the East Coast with his family as a young child. He is a graduate of the Wilmington Christian School and Gettysburg College in Gettysburg, Pennsylvania. He holds a master's and doctoral degree from the University of Delaware. 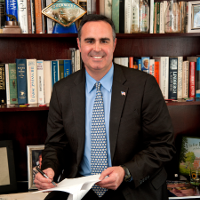 Dr. Lopez is a member of the Delaware State Senate, representing the 6th Senatorial district serving the Milton, Lewes, Harbeson, Rehoboth and Dewey Beach area. He was elected to office in November of 2012 and is the first Latino elected to the Delaware State Senate.